Southampton failed to secure their first away win against Burnley in over 47 years after conceding a last-minute penalty which Ashley Barnes converted to cancel out a wonder strike from Nathan Redmond. 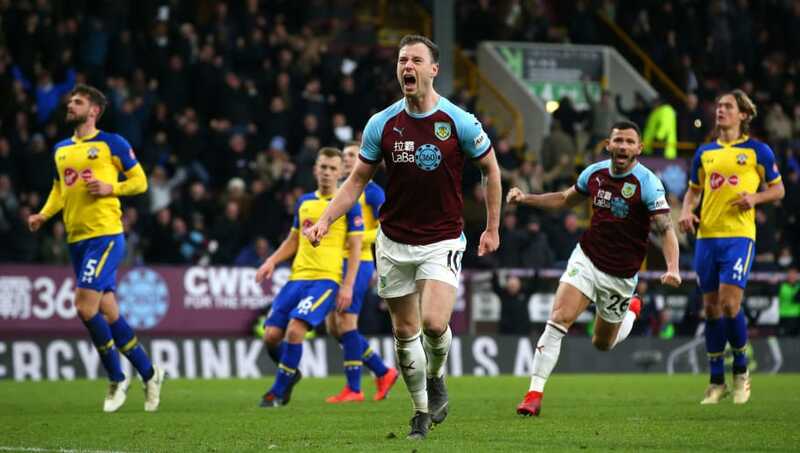 Barnes and Danny Ings both saw early chances kept out of the back of the net by Alex McCarthy and Tom Heaton respectively, but it was largely a quiet first half between the two relegation candidates at Turf Moor. Burnley were, however, somehow denied a penalty when goalkeeper McCarthy clattered into Barnes in the Southampton penalty area - they were last awarded a spot-kick 67 games ago - and instead referee Anthony Taylor booked the striker for simulation. The game looked like it was set to be a stalemate as neither side could find the breakthrough, but a moment of magic from Redmond proved to be too much for Burnley as he skipped past a challenge and fired the ball past Heaton. During Burnley's search for an equaliser, Barnes missed a golden chance from close range before seeing an instinctive volley crash off the crossbar. The hosts were eventually given their chance to secure a deserved point on a plate when defender Jack Stephens was penalised for a handball inside the penalty area, and Barnes stepped up to fire the ball past a static McCarthy with the last kick of the game. Burnley's players might not have dropped their heads after being seeing a fairly straightforward penalty decision go against them during the first half, but it did prove to be one decision too many for the home fans to take. A gentle touch on Lingard's shoulder which sends him theatrically to the floor is a penalty yet this isn't? Even worse he's booked for it!! It feels like there's some sort of agenda. That proved to be a double-edged sword for the hosts. Although the fans spurred what was, in the first half, nothing more than average attacking opportunities into good chances, the players stopped showing the grit under pressure that we've come to expect from a Sean Dyche side. Heaton (7), Bardsley (6), Tarkowski (5) Mee (7), Taylor (6); Hendrick (5), Cork (6), Westwood (5), McNeil (8*); Barnes (7), Wood (6). Substitutes: Gudmundsson (6), Crouch (6), Brady (6). Burnley's teenage superstar Dwight McNeil was the driving force behind their best attacking play throughout the match. He exploited Southampton's three-man defence brilliantly and caused James Ward-Prowse to drop back deeper on the pitch. While the Englishman failed to provide that killer touch in the final third, McNeil was the only Burnley player to break through the lines and offer an out ball for the midfield, although he was largely a passenger once Southampton took the lead. It might not have been a great advert for the Premier League, but Burnley weren't outclassed by Southampton at Turf Moor on Saturday. They largely matched the Saints punch for punch, but defender James Tarkowski looked too be slightly off the pace and he relied too heavily on his partner Ben Mee as a get out of jail free card. An away day at Turf Moor isn't the ideal fixture when you're still considered to be in a relegation battle, but Southampton stuck to their game plan and it looked like it would pay off thanks to Redmond's second-half strike, but Burnley had the last laugh. The Saints look like a completely different since Ralph Hasenhüttl took over on the south coast and any talk of a relegation battle is quickly being swept under the rug now that they're five points clear of the bottom three. McCarthy (6), Bednarek (5), Stephens (6), Vestergaard (6); Ward-Prowse (5), Slattery (7), Romeu (6), Targett (6), Armstrong (6); Redmond (8*), Ings (7). Substitutes: Long (6), Valery (6), Austin (N/A). There really is magic in the right foot of Nathan Redmond, and he showcased once again on Saturday that he has the individual quality that should put him in contention for a place in Gareth Southgate's England side. Under new manager Hasenhüttl, Redmond has taken up somewhat of a free attacking role in Southampton's attack. Danny Ings' early injury threatened to put their pre-match tactics under threat, but the 24-year-old single-handedly opened the scoring and afterwards, continued to be a thorn in Burnley's side by finding acres of space in the final third. Through no real fault of his own, James Ward-Prowse had an afternoon to forget in the north-west. The England international is called upon to defend more than he's used too in Southampton's 3-5-2 formation, and that responsibility wasn't helped as he was directly up against the lively Dwight McNeil. Dyche's side travel to the south coast next week where they will take on Brighton & Hove Albion in the hopes of getting even more breathing space over the relegations zone. Southampton and Hasenhüttl will welcome Cardiff City at St Mary's next week before preparing to travel to Arsenal in one of the Austrian's biggest tests since joining the Saints in December.